The Raving Queen: Still So Much Fun, Girls!!!!!!!!!!!!!!!!!!!!!!!!!! Still So Much Fun, Girls!!!!!!!!!!!!!!!!!!!!!!!!!! If there is one film that has been written about more on this blog, it is "Rosemary's Baby." It is amazing how much this beloved film keeps turning up in revivals, and yesterday, on a PERFECT day off, I traipsed down to the Film Forum, to see the first screening of their week long run of this brilliant film. What's there to say, that has not been said??????? Well, who knew witches drank so much coffee and tea??????? 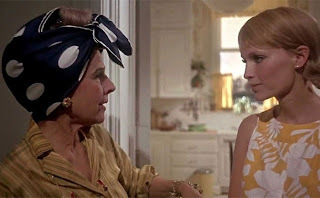 I still have my eye on that hourglass coffee pot that Mia Farrow uses, as well as that bright orange painting of the burning church, seen in the Castevets' apartment, at the film's climax! Get me both at once, darlings!!!!!!!!!!!!!!!! Things got a little dramatic, even before the screening began. The audience was a mixture of seasoned viewers, like me, some who were seeing the film for the first time, and others who looked old enough to be members of the coven, themselves!!!!!!!!! Indeed, who knows??????????? But fifteen minutes before the screening, in walks this elderly lady, flanked by a theater employee, who is obviously trying to calm her down, screaming at the top of her lungs all the standard negative things about Roman Polanski!!!!!!!!!!!! I thought she had wandered into the auditorium by mistake, or was doing this as some kind of protest statement. Would you believe she took a seat in the front row, and sat, rapt, through the entire picture???????????? I mean, what gives???????? If you are that down on Polanski, then do not see his films!!!!!!!!!!!!!! I have no idea why she was there!!!!!!!!!!!!! I am sure the evening shows will sell out on the weekends, so get your tickets early, or online. And for those evening viewers, guess what????????? Da Silvano is just right up the street from the Film Forum!!!!!!!!! You can have an elegant meal, and maybe catch a sighting of Grace or ANNA!!!!!!!!!!! Who, by the way, darlings, are NOT witches!!!!!!!!!!!!!!!!!!!!!!!!!!! !